Physical installation within minutes with the help of comprehensive and easy-to understand quick installation guides for the NVR and IP cameras. Store videos and snapshots to external storage, such as the client, over the Internet. Configurable motion detection and camera tamper detection settings, including configurable alarm alerts, such as automatic emails (with attached video or snapshot) and automatic alerts (such as buzzers or flashing lights). 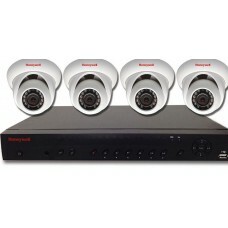 Description Introducing the new Performance Series IP kits from Honeywell. The kits feature 1..